Valerie Redd in You/Emma. Photo by Samantha Fairfield Walsh. BOTTOM LINE: A brief summary of, and feminist reflection on, Madame Bovary and the ways it is, or isn’t, relevant to modern life. 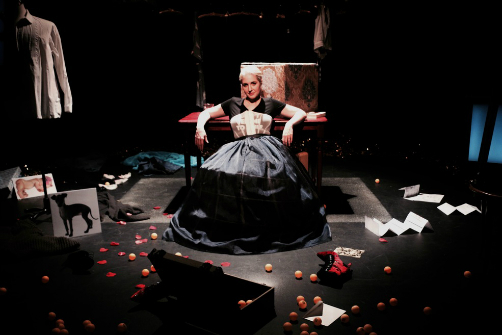 Performing for a short run at IRT Theater, YOU/EMMA, a sharp-witted one-woman show by Paz Pardo, reflects on how Madame Bovary is, and isn’t, relevant to young women’s lives today. YOU/EMMA takes place in both past and present; even the scenes set in the early nineteenth century are aware of twenty-first century sensibilities. The show opens with Redd in modern attire—black leggings and a “Don’t tell me to smile” t-shirt. Once we travel back to the 1830s, Christina Renee Polhemus’s clever costume design shines through as Redd dawns a hoop skirt and a sheer corset which leaves the t-shirt’s modern feminist mantra barely visible. Though Flaubert’s novel begins by introducing the past of Emma’s husband Charles Bovary, this production dives right into Emma’s perspective. She introduces Charles using a tailor’s mannequin dressed in a highly unfashionable knitted sweater which is only capable of speaking in droning “moo’s.” In other words, this is a pretty accurate representation of how Emma views Charles. Once they marry, Emma is overcome with boredom. To help the time pass, she immerses herself in romantic novels and fashion magazines, which are represented through romantic films and televised fashion competitions. To make matters worse, Charles decides to move his medical practice to an exciting town called “Yonville.” What could go wrong? A lot, apparently. It’s in Yonville that Emma meets her future lovers, the hopeless romantic Léon and the conceited womanizer Rodolphe, both represented by the same mannequin but with different outfits. Her spending habits grow worse as she falls deeper into her fantasies of having a life far more lavish that the dreary one she feels has been forced upon her, adding to her debts which are bound to crush her later. As Emma ages, Redd makes witty comparisons between past and present. When Emma and Charles are invited to the ball, she reminds the audience that at Emma’s current age, “if this were now, you’d be decorating your first dorm room.” Instead it’s the 1840s and Emma is obsessing over her first ball gown. Sometimes these comparisons are more depressing, showing how society may have simply exchanged one kind of mediocrity for another. Sometimes Flaubert himself, also played by Redd, comments on the production through the on-stage screens. At one point he proclaims “I am Emma Bovary,” only to later contradict himself and claim that he hates Emma. He not only reveals his self-loathing, but also the extent to which he resents what he describes as the “social hypocrisy of women.” This is amongst other sexist proclamations which Emma debates with him, making YOU/EMMA feel like an exploratory essay adapted for the stage. Redd’s performance is a delight as she brings wit and irreverence to Emma, shining a light on everything that makes the character all at once extraordinary, relatable, and deeply flawed. She’s a perfect fit for Pardo’s razor-sharp humor, and the design team has deftly brought to life the show’s penchant for time-trotting. That said, despite YOU/EMMA’s attempts to summarize Madame Bovary in a modern and easily digestible fashion, its pokes and jeers at academia’s treatment of the novel inevitably speak louder to those already familiar with Flaubert’s work. YOU/EMMA is conceived and performed by Valerie Redd. Written by Paz Pardo. Directed by Devin Bain. Lighting and Sound Design by Jessica Greenberg. Scenic Design by Bruno-Pierre Houle. Costume Design by Christina Renee Polhemus. Video Design and Direction by Kate Eminger. Choreography by Brad Landers. Bovine Vocal Artist is Juston LeBaron. Production Stage Manager is Lyndsey Barratt.